Some performances are gone the next day. Forgotten. Some stay with you a little longer. And some keep on popping up in your mind. Such as Hunter, the first evening-length solo by Meg Stuart. I watched the American choreographer perform it a couple of months ago in Essen, and scenes and images from it have been coming back to me regularly, since. Hunter, a piece about memories. 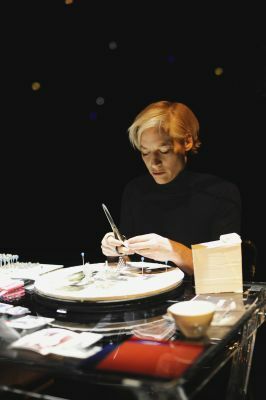 The Venice Biennale wanted it on its programme last June, and the well-respected German magazine tanz awarded Meg Stuart the title choreographer of the year for it. The piece will have its Belgian premiere this week at Kaaitheater, Brussels. A first of a special kind. After a career spanning twenty years, Hunter is actually Meg Stuart’s first evening-length solo. It premiered in Berlin (March 2014). It is a piece centered around memories, but it is certainly not solely about the past, as it is strangely contemporary too. 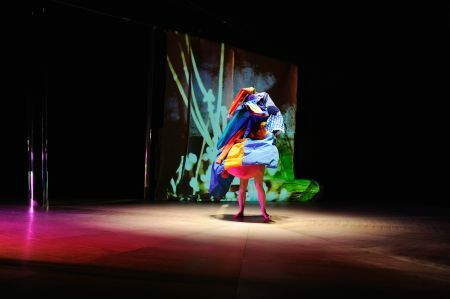 It bears a resemblance to Sketches/Notebook, the previous piece by the American choreographer and her Belgian-based company Damaged Goods: Hunter also consists of a series of scenes in which Stuart mixes movement with elements from visual arts (colors, light, video, the texture of things) and theatre. It is set to a dizzying soundscape (by Vincent Malstaf): an impressive collage of sounds, music and spoken word, which makes you wonder afterwards: did I really hear Willem Vermandere, Question Mark & The Mysterians ánd Jonas Mekas? Look at what my body is doing. I don’t know any other performer able to so skilfully detach her persona from the movements her body is making. As if she herself is amazed by what those arms are coming up with, oh and look how they move in a completely unexpected way. Hunter comprises once again one of those sequences Meg Stuart is extremely good at. It looks as if her body is an antenna, and it keeps on receiving different signals, from one surprise to the next. In this case: switching from one memory to the next. From one remembered movement to another one. The body as a brain: remembering. Just as that soundscape seems to be continuously switching channels too, jumping from music to spoken word. Its one of the scenes that have been coming back to me. The beginning, I clearly remember as well, Meg Stuart sitting at a little desk, cutting up family pictures and then rearranging them, in what looks like an artist’s lab. Or that moment she all of a sudden starts talking, almost in a stand up-comedy sort of way. Explaining why she tried to stay away from talking on stage, and then telling an amusing story that jumps from Trisha Brown to Casper The Friendly Ghost and kundalini yoga. I remember the color orange. Carpets. A set design mixing a spiderweb with a circus tent. 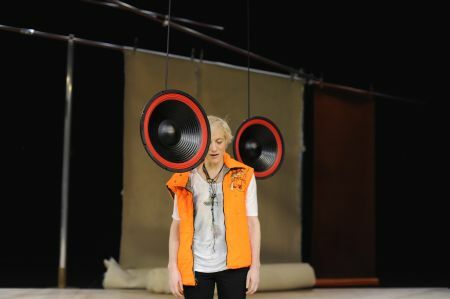 And then that fantastic scene in which a pair of speakers descend from above and Meg Stuart starts singing with Yoko Ono. I also clearly remember sitting there, in the bar, afterwards, perplexed by this information overload, wondering what to make of it. There’s no denying that once again Hunter proves how gifted Meg Stuart is as a contemporary choreographer, mixing all those different elements, distorting them, exactly knowing what to do with them, sensing when it’s time to move on to the next scene. All of it is real, I was told afterwards. The photos, the video footage, the voices (her brother): it all really is from her past. And so Hunter combines life (family) and work (influences). But it is not about the puzzle, about trying to put all the pieces together as a viewer, about figuring out what the link is between exhibit A and memory B, about lessons learned. For years I’ve written a diary, because I wanted to hold on to the past. Until I realized that it was no use. There is no way you can capture everything, and remember everything. Hunter reminded me of that feeling. It presents someone trying to tell you about everything she is made up of, but knowing that ultimately it’s no use, trying to talk about everything. But you’ve lived a life, you’ve collected thoughts, sounds and images along the way. Hunter is the Meg Stuart way of dealing with that, and she does so, not only in a strangely beautiful, but also in a very contemporary way, in this world in which everybody is coping with an information overload. It’s as a (very distorted) Pinterest page coming alive. Postscript October 2016: “Hunter” is coming to North-America. It will be performed at Usine C, Montréal (13, 14, 15 October) and Redcat (CalArts), Los Angeles (26-28 January 2017). 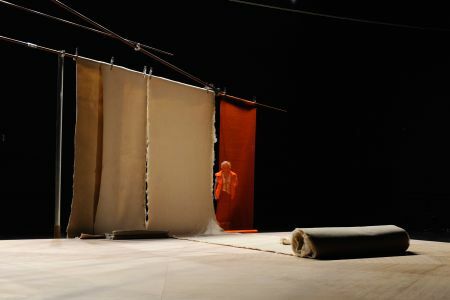 This entry was posted on October 13, 2014 at 15:48 and is filed under dance with tags Brussels, critique, Kaaitheater, recensie, review. You can follow any responses to this entry through the RSS 2.0 feed. You can leave a response, or trackback from your own site. Reblogged this on Steph Hutchison.